I have been avoiding Tower Defense games for the past three years. It's not that I don't like the genre -- quite the contrary, I love it so much that I get afraid I would spend too much time playing. Today, I will share with you a unique Tower Defense game that peaked my interest so much that I decided to break my long hiatus. Anthill is gorgeous Tower Defense game that utilizes a unique trail-drawing mechanic for controlling your soldiers. Anthill is a tactical real-time trail defense game on iOS that is based on the real-world behavior of ants. Instead of building towers, you control an army of ants to gather food, attack enemies and protect your ant hill. There are four different ants in the game, i.e. the worker, the warrior, the spitter and the bomber, each bearing a different purpose. Worker ants are the smallest of the bunch and are responsible for gathering food and bringing them to the queen inside the ant hill. Warrior ants are the strongest of the family and are responsible for defending your workers and the anthill. Bomber ants and spitter ants are your attackers. They have different attacking and defensive traits, so you need to use them appropriately against enemy units. You control the ants by drawing trails that start from the anthill. You can draw a straight path to a destination of your choice or a circle that would protect your workers who are trying to collect food. At the end of your drawing stroke, you will be given the option to assign a color to the line to indicate the type of ants that will use the path. Only the ants that are associated with that color can use that path, so you can control which ants go where. If you want to delete a path, you can tap to select it and hit the X button. If you have accumulated enough food, you can spawn a new ant to add to your army. A warrior costs twice as much as a worker ant and spitters/bombers cost even more, so you need to carefully plan your budget. In addition to collecting food, you will also face waves of enemy units trying to attack your ant hill. These waves are time-based, i.e. they will come to attack whether you are ready or not. It should also be noted that when you have successfully killed an enemy unit, you can collect its carcass to use as food. Thus, the more aggressive you are when attacking, the more time you have to collect the carcasses of your enemies in-between the waves and the more food that you can accumulate. You control four types of ants to work together to ensure the survival of your anthill. Unlike most Tower Defense games, Anthill requires you to draw trails to direct where your ants would go. 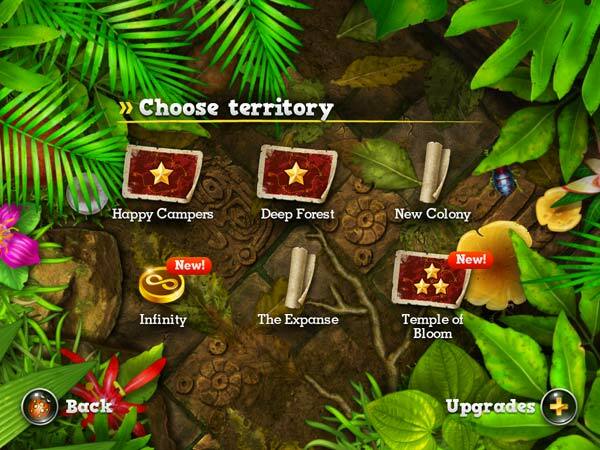 Due to its real-time aspect, the game requires constant maintenance of these trails. You will find yourselves drawing paths and deleting them later when they are no longer relevant. The ants would follow the path that they were assigned to as long as you have not deleted it. Since you have a limited number of ants, properly assigning them in a timely manner is crucial to completing the missions. The game has two modes, i.e. campaign mode and endless mode. In campaign mode, you will be playing with pre-defined missions, including the tutorials. In endless mode, you will find yourselves facing endless waves of enemy units in an effort to stay alive for as long as you can. There is also a boss wave for every five waves that you survived. In this survival mode, you will get to repair the damages done to your anthill by sending out workers to collect dirt and prolong your survival in the game. Now, I can go on and on about how the game works in Anthill but I think it would be beneficial if you could see it in person. Thus, I am attaching a gameplay footage that were published by the developers. As a fan of Tower Defense games, I have played various titles on various platforms over the years. One of my main reason for choosing Anthill as my new favorite is because it has unique features that really make it stand out. While the name of the genre is Tower Defense, I like the way the game rewards you for being more aggressive by giving out more stars when you collect more food and kill more enemies in your missions. These stars can then be used to upgrade your ants and increase your ability to protect your home. I also like how unlike most Tower Defense games, Anthill allows any upgrade I made to be carried over to subsequent games. Another thing that I like about the game is how the in-game tutorial is also nicely designed to properly leverage the players to the learning curve required to master more complex levels. This makes it easy for even newbie Tower Defense players to pick up the game and play. Last but not least, I also like the fact how the beautiful graphics and animation in Anthill create an immersive experience. The graphics are so incredibly detailed that even Camila, who is not really a fan of Tower Defense games, commented that she would probably get the game for the graphics alone. The upbeat original background music also completes the overall gaming experience. Complete missions to earn stars that you can use to upgrade your ants. I really enjoyed playing Anthill because it is not your typical Tower Defense game. Its unique trail-drawing tactical gameplay and beautiful graphics are two reasons why you should give it a try. If you are looking for a Tower Defense game with a fresh gameplay, I would highly recommend Anthill for you.